“Sika Asem” is a common expression in Ghana. Money matters. In other parts of the world people might claim that “money is the root of all evil” but in the Ghanaian marketplace, SIKA (money) is what makes the world go round. 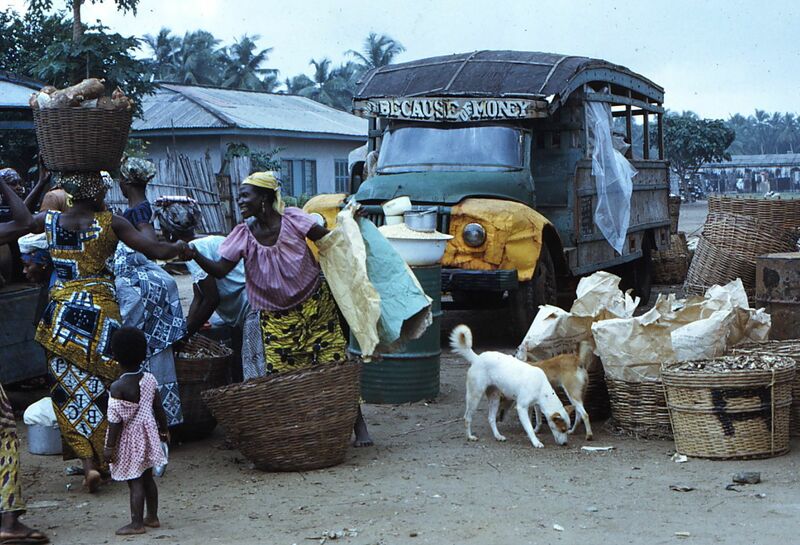 In this scene outside the Half Assini Market in 1973, we see women negotiating prices for their commodities (smoked fish and yams) and a mammy lorry waiting to carry them home with their wares. Notice the little girl with no shoes-a common sight in those days, not so now at all. Things have improved!